The Humane Society is always happy to have volunteers come out and help care for our animals. The animals like new faces as well. To volunteer, just come to the shelter any day we are open and tell a staff member that you would like to volunteer. On your first day, you will need to submit a completed Volunteer form. After that, you only need to sign in on the volunteer sign-in sheet at the reception window. Please note that during the school year we ask you to please call the shelter to check on availability. When you volunteer, you may be asked to do any number of things, such as cleaning, feeding, watering, or socializing the shy and sometimes withdrawn animals at the shelter. PARENTS: There is an accepted level of risk when your children volunteer at the Humane Society. There are loose dogs and cats in the shelter during working hours. Your child has the potential to be bitten and/or scratched. We have limited staffing and will not be watching your children. If they aren't aware of how to read animal posture, or behave appropriately with the animals, they are at high risk of being injured. Most of the dogs and cats are friendly, but if cornered, struck or taunted, they will defend themselves. Also, many of the dogs can be "mouthy" and will jump up and knock down smaller children. We ask that any child who cannot handle this responsibility not volunteer. If your child is allergic to animal dander they should not volunteer. They're going to get dirty and hairy, but we hope they have fun! Check in with a staff person upon arrival. Sweeping or mopping floors, washing windows, walls, etc. While at the shelter, listen to what the staff member advises you to do. The staff member is responsible for your actions, so please do as instructed. You might hear many things while you are at the shelter, including stories about people abusing their animals and many other issues. 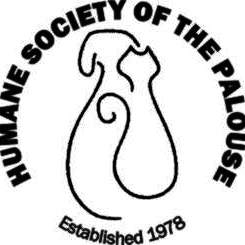 You aren't to speak for the Humane Society of the Palouse, Inc. concerning its animals, policies and procedures, or other matters involving the Humane Society. These matters will be handled strictly by the staff or Board of Directors. The sick/isolation room is off limits unless otherwise instructed by a staff member. You must follow all of our disease control procedures. This is for your safety, as well as the safety of the animals at the shelter and in your own home. If you see a customer who needs assistance, please alert the staff. Do not ever attempt to answer questions yourself. Please don't answer the phone. If an animal needs special attention (fighting, nails needing to be clipped, or worse), please do not attempt to solve the problem yourself, but get a staff member to help. • You must be at least 12 years old to volunteer with a parent, 16 years old to volunteer alone. • You must be able to control the dogs you walk and spend at least half your time with the one you pick before getting another dog. And you must pick up after your dog on the city street. • There is a 3-strikes rule! If we have to remind you about following these rules three times, you will not be allowed to return to volunteer without a parent.